Hyatt Place is an exciting and innovative new select service hotel offering more of what is important to todays travelers. Our guests enjoy a spacious guestroom with a 42 inch high-definition flat panel TV, our signature Hyatt Grand Bed, a plush Cozy Corner oversized sofa sleeper that is separated from the sleeping area, and complimentary high-speed Wi-Fi internet access throughout the hotel. The innovation extends beyond the guestroom. Our Gallery is a warm and open area that features an intimate coffee and wine cafe, a TV den and an e-room with free access to a public computer and printer. Guests at Hyatt Place will also enjoy a Enjoy our complimentary Gallery Kitchen Breakfast, with hot breakfast items, fresh fruit, oatmeal and plenty more to choose from and can purchase freshly prepared menu items, premium espresso drinks, or beer and wine 24 hours a day. Pet policy: 1-6 nights a 75 non-refundable fee. 7-30 nights a 75 non-refundable fee plus an additional 100 cleaning fee. Maximum of 2 dogs per room are permitted. Weight must be 50 lbs or less max of 75lbs per rm. Fees are in USD. Service Animals exempt from fees. P.F. Chang s China Bistro: Featuring a blend of traditional Chinese cuisine and American hospitality in a contemporary bistro setting. Open for lunch & dinner. Macaroni Grill: Vaulted ceiling decor combined with a lively atmosphere add to enjoyment of delicious Italian fare. Open for lunch and dinner. Longhorn Steakhouse: Texas roadhouse style restaurant featuring a menu consisting of fresh cut steaks, as well as salmon, shrimp, chicken, ribs, pork chops and prime rib. Open for lunch & dinner. 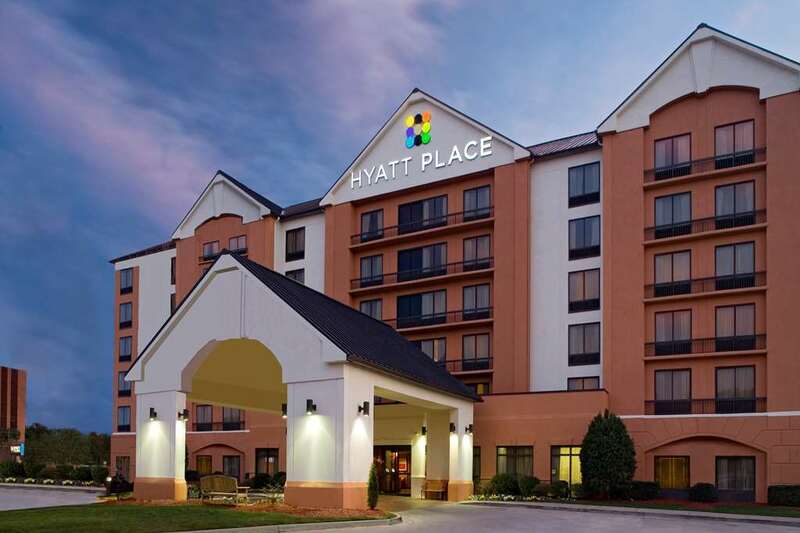 The Hyatt Place Columbus-Dublin is located in the beautiful upscale Columbus suburb of Dublin. The Mall at Tuttle Crossing, numerous restaurants and office buildings that surround the hotel make this hotel a comfortable and convenient place to stay. COSICOSI - Columbus Center of Science and Industry is a hands on science center featuring traveling and permanent exhibits that are fun for the whole family. Columbus Crew StadiumColumbus Crew Stadium is home to the MLS Columbus Crew Soccer team. The stadium hosts numerous World Cup qualifiers and high school sports events. Columbus Zoo AquariumColumbus Zoo is the home of Jack Hannah and offers the whole family an interactive adventure of fun. Mall at Tuttle CrossingMall at Tuttle Crossing includes the following anchor stores: Lazarus, Sears, JCPenney and Kaufmann's. Muirfield Golf Country ClubMuirfield Golf & Country Club is home of the PGA's Memorial Golf Tournament and Jack Nicklaus. The tournament is held in late May or early June each year. Nationwide ArenaNationwide Arena is the home of the Columbus Blue Jackets and the Arena Football league Columbus Destroyers, as well as, concerts and events. Polaris Fashion PlacePolaris Fashion Place offers over 175 stores with 7 anchor stores including The Great Indoors, Kaufman's, JCPenney's, Lazarus-Macy's, Saks Fifth Ave, Sears, and Lord & Taylor's. Zoombezi Bay Water ParkZoombezi Bay Water Park featuring water slides, amusement park with rides, video games and is a worldclass family entertainment complex.